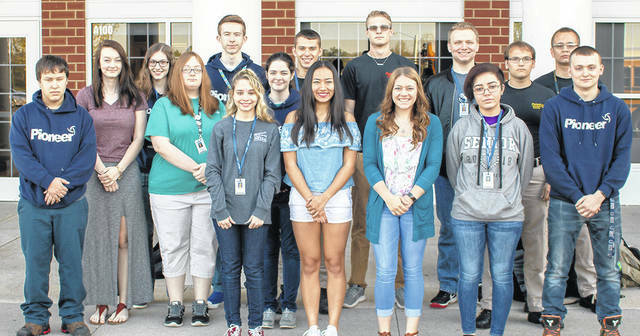 SHELBY — Galion High School students were recognized last week at the annual Pioneer Career and Technology Center awards program. Students receiving awards included: Lucas Bash, Jr. Web Page Design & Programming (Junior Citizenship Award), Ecco Bosworth, Jr. Graphic Arts (Junior Citizenship Award), Zachary Carroll, Jr. Teaching Professions (Educators Rising Treasurer), Vincent Christini, Jr. Welding (Junior Citizenship Award), Debbie Clark, Sr. Health Assistant (Two-Year Perfect Attendance Award), Tanner Crisman, Sr. Homeland Security (Senior Citizenship Award), Brendan Damron, Jr. Homeland Security (Junior Citizenship Award), Ethan Eckels, Sr. Automotive Technology (Quality Performance Award), Macy Eicher, Sr. Dental Assistant (Work Ethic Award), Gideon Johnson, Sr. Industrial Electricity Technician (SkillsUSA Reporter, Senior Citizenship Award), Autumn Jones, Sr. Early Childhood Education (Quality Perfomance Award, Two-Year Perfect Attendance Award, Work Ethic Award), Chloe Klepatzki, Jr. Graphic Arts (Director’s Attitude Award), Claire Miller, Sr. College Now-Business (Quality Performance Award), Michael Montgomery, Sr. Industrial Diesel (Senior Citizenship Award), David Riddle, Jr. Automotive Technology-Level One (Director’s Attitude Award), Jacob Rudd, Jr. Teaching Professions (Educators Rising Vice President), Kyle Shope-Williams, Sr. Media Communications (SkillsUSA President), and Alexa Tinch, Jr. Media Communications (Junior Citizenship Award). An additional group of Galion seniors were recognized as scholarship recipients during the awards program, including: Cheyenne Blair, Sr. College Now-Business (Ohio Northern University scholarship), Takoda Crisman, Sr. Web Page Design & Programming (Marine GI Bill scholarship), Allison DeNero, Sr. College Now-Business (Ball State University, Louise and Davis Scholarship, Freese Scholarship), Jacobi Jessie, Sr. Homeland Security (NC State College Tuition Freedom Scholarship), Gideon Johnson, Sr, Industrial Electricity Technician (NC State College Tuition Freedom Scholarship), Autumn Jones, Sr. Early Childhood Education (NC State College Tuition Freedom Scholarship), Mia Knipp, Sr. College Now-Business (Louisiana State University Academic Scholarship), Claire Miller, Sr. College Now-Business (Gorman Family Foundation College Now Scholarship, Bowling Green State University Freshman Academic Scholarship, Bowling Green State University President Scholars, Galion Davis Scholarship), Michael Montgomery, Sr. Industrial Diesel (Ohio National Guard Scholarship), Max Papenhausen, Sr. Homeland Security (NC State College Tuition Freedom Scholarship), Kiran Santel, Sr. Cosmetology (NC State College Tuition Freedom Scholarship), and Marissa Snyder, Sr. College Now-Business (Otterbein College Scholarship).